Overview: Young Adult—a.k.a. YA or Teen—Literature is designed for, let’s say, twelve to eighteen year old readers. But it’s catching on with all-aged readers. Certain books hover between Young Adult/Teen and Juvenile so that libraries will hold copies in both departments. 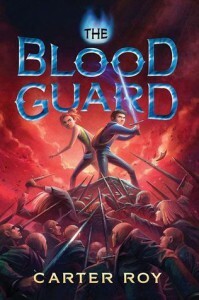 Such is “Blood Guard” by Carter Roy (Amazon 2014). At the onset, Evelyn Ronan Truelove fevered, wearing pajamas, inches along the ledge of his Brooklyn brownstone after his house has mysteriously caught fire. He tells us his mother keeps him busy taking classes in gymnastics, fencing, archery—every kind of lesson available, it seems. For a boy named Evelyn, it’s not surprising that a bully “with fists the size of cantaloupes” nearly gets him. These classes seem like a good idea. And it’s time people started calling him Ronan. Post fire, the family moves to Stanhope, PA and the next thing we know there’s a high speed car chase, his mother driving him down the concrete steps of a city park, quite adeptly. Strangely robotic men in suits are chasing them. His mother tells him his dweeby father is missing, lets Ronan off near a train station with a train ticket to Washington DC and says that someone in the Blood Guard—a group of good guys of which she is part—will help him there. And “trust no one.” All this is news to twelve year old Ronan. Ronan is met by a skinny Brit pickpocket, Jack Dawkins—oh yes, isn’t that the name of the Artful Dodger in Dickens’ “Oliver Twist”? Dawkins explains that the Pures, a handful of truly good people—keep the good of civilization in balance. He says, “The Pure can’t know what they are because it would change who they are.” What a great line. And concept. The book is straight ahead action as meek Ronan and the good Blood Guard fight the evil Bend Sinister, which should engage boy readers. The theme of good versus evil is not new, but this is well written and alternately hilarious and exciting, could catch some reluctant readers with its cast of terrific characters—spunky Greta, foster child Sammy, even the villains are grand. Or listen to it read by Nick Podehl (Brilliance 2013) with nuance and subtlety. What a treat!